Why aren’t the U.N. and U.S. pressuring Khartoum to reverse this horrific trend? Darfur has become all but invisible. With fewer and fewer human rights reports, news dispatches, or even candid accounts from U.N. leaders, events in the region have dropped almost fully out of international view. Facilitating this slip is the fact that global attention has recently shifted away from Darfur to other areas of Sudan: to negotiations with Khartoum, to the south’s independence referendum in January, and, more recently, to the mounting crisis in Abyei, the contested border area between the north and the south. So have things improved in Darfur? On the contrary, the catastrophe there is deepening dramatically as we head into this season’s “hunger gap,” the dangerous, rainy period between the harvests of this past fall and winter and the next harvests, which begin in October. Water-borne diseases become much more common, and this year looks especially threatening, as hygiene, latrine maintenance, clean water, and primary medical care have all been attenuated by increasing restrictions on travel imposed by the Khartoum regime. Hundreds of thousands of lives are at acute risk. Khartoum has long made clear that it wanted to “domesticate” the peace process, and, for this reason, has merely been going through the motions during stalled peace talks in Doha. It has also made clear for many years that its fundamental ambition (and now “peace” strategy) is to return displaced persons to their former villages and lands, typically destroyed or occupied by Arab militia forces. (Estimates show that the crisis in Darfur has displaced over 2 million people, and, according to the U.N., there are about 100 camps for the displaced in Sudan, though the number is likely higher.) This “New Strategy for Darfur,” approved by the regime in September 2010, was supported by then-U.S. envoy Gration and African Union envoy Thabo Mbeki, former president of South Africa. It was a signal from the world to President Omar Al Bashir’s regime that it could more or less have its way in Darfur—and the results have been horrific. The regime’s latest military ambitions for Darfur were also announced last year, under the code name “Misk Al Khitam,” or “The Perfect Ending.” This ominous campaign has included massive bombardments and other aerial attacks on civilians. It falls very much in a pattern of violence that extends back over twelve years and includes more than 1,400 confirmed attacks by Khartoum on civilian and humanitarian targets throughout Sudan, both north and south. There have been scores of attacks this year alone. An armed group on four Land Cruiser cars, five horses and thirty camels burnt 20 huts in the village of Sangira, 25 kilometers east of Kutum at 4:00 p.m. on Sunday [May 1, 2011]. One of the residents of the village told Radio Dabanga that the gunmen first took all the stored food which belongs to the citizens of the village at gunpoint and after that set fire to 20 huts. Thirteen (13) citizens were killed and 10 people wounded in two consecutive airstrikes in South Darfur. An Antonov plane belonging to the Sudanese Army dropped bombs on the area of Asharaya in Yassin district of Darfur this Sunday morning leading to the death of 12. The second incident happened in the area of Libdo [Labado], leading to the death of one. Close to one hundred families fled from the area west of Shangil Tobaya and East Jebel Marra to the valleys and mountains, seeking refuge after local militias backed by government forces raided their villages. A witness told Radio Dabanga that the forces centered in Shangil Tobaya moved with more than 20 cars backed by local militias on camel and horse backs and burnt down the villages of Abu Mara, Jurab Elray, Asilowa, Karko and Linda on Sunday. Khartoum has immediately and predictably denied access to both investigators and humanitarians trying to reach the civilian populations in areas that have been bombed. Indeed, even as humanitarian conditions deteriorate, more and more aid personnel are being expelled, while others are leaving for security reasons. Consider one incident that took place in West Darfur on January 7, 2011: “An unidentified armed group on Wednesday night opened heavy fire on the headquarters of a distribution point of the World Food Programme (WFP) in Darfur [near Zalingei],” Radio Dabanga reported. These sorts of things generally don’t happen without the acquiescence of Khartoum’s Military Intelligence in Darfur. Officials responsible for children’s care in Zamzam A and Zamzam B [camps in North Darfur] informed UNICEF on Monday [May 2] that the rate of death among children reached thirteen deaths per week in the past two weeks due to the spread of cases of measles and diarrhea among the newly displaced children. While Radio Dabanga regularly chronicles attacks in Darfur, the U.N.-African Union hybrid mission there (UNAMID) does so only rarely. Indeed, while the presence of UNAMID, with some 25,000 peacekeeping personnel, has led many to believe that there has been an adequate security response to the crisis in Darfur, this is untrue. UNAMID has done little to protect either civilians or humanitarians; the mission can barely protect its own members, and it endures continual denials of access by Khartoum’s security services, despite a Status of Forces Agreement guaranteeing freedom of movement. UNAMID is poorly manned and equipped, and it is burdened by both dismal morale and the incompetent leadership of Ibrahim Gambari. Gambari does not speak forcefully or consistently enough about Khartoum’s attacks on civilians, despite the demand of U.N. Security Council Resolution 1591 (in effect since March 2005), which bans all offensive military overflights in Darfur. Instead, he downplays Khartoum’s denial of access to the UNAMID force he heads. Then, there is the chief of U.N. humanitarian operations in Sudan, Georg Charpentier, who won’t speak candidly about conditions in Darfur, including those affecting aid workers: data and reports on malnutrition, IDPs, and humanitarian access in the region. Amid growing levels of malnutrition, illness and instability in Darfur displacement camps, United Nations aid and peacekeeping agencies are being accused of capitulating to pressure and interference from the Sudanese government and failing in their duty to protect civilians. 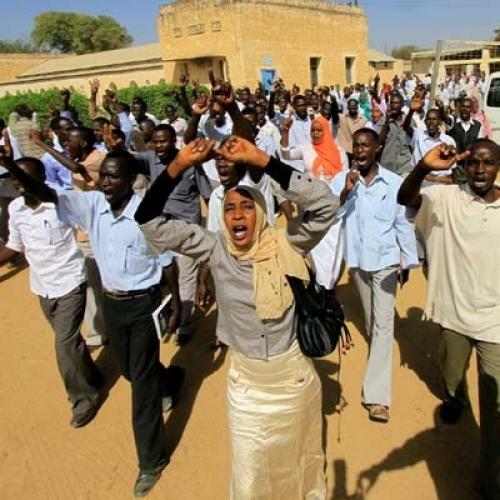 Human rights and civil society activists are joining the region’s internally displaced people, IDPs, and Sudanese opposition politicians in calling on UN agencies not to duck their responsibilities in order to keep Khartoum on side. But it is not simply the problems with UNAMID and Georg Charpentier that have done harm in Darfur. The United States has played a role, too. Last August, senior Obama administration officials reportedly agreed to “de-emphasize” Darfur in favor of the southern referendum. Still later, as negotiations with Khartoum’s génocidaires reached a critical phase, the administration decided to “decouple” Darfur from discussions of the most potent incentive on the table: the removal of Khartoum from the State Department’s list of terrorism-sponsoring nations. Negotiating over issues of terrorism seems ill-conceived as a general matter, but, in Sudan, it seems particularly inappropriate, since there is strong evidence that President Omar Al Bashir’s regime continues to support Hamas, mainly by serving as a conduit for Iranian arms moving through Sudan to Gaza. All the while, Radio Dabanga has continued to provide a daily chronicle of what’s happening in Darfur, with details that are soul-destroying: “A sheikh from the [Otash] camp revealed that ten children die daily in three centers out of eleven centers in the camp infected by the diarrhea.” (May 23); “Four children in refugee camps around Mershing in South Darfur passed away due to a shortage of food and malnutrition, according to the statements by official figures in the camp. They have not received any relief for seven months which led to an increase in the cases of malnutrition because our hunger.” (May 3); “A sheikh from [Kalma] camp said that the suffering in the camp is increasing and that death in the camp has become something common. The sheikh also pointed out that the overall rate of weekly deaths exceeds 50 children.” (May 2). The reports are endless. So too, evidently, is the capacity of the international community to pretend that none of this is happening, or to ignore it, or to not care enough to act. Assisted by a group of diplomats who can’t seem to deal with more than one crisis in Sudan at a time, Darfur’s ongoing catastrophe is poised to result in even greater human destruction and suffering. The world has all the evidence needed to know that this is so, but it lacks the resolve to bring to bear on Khartoum the pressure that will change the regime’s brutal ways. The Obama administration should make clear that, unless Khartoum grants unfettered humanitarian access and freedom of movement for the U.N. peacekeeping mission, the regime will see no lifting of sanctions, no further discussion of removal from the list of terrorist-sponsoring nations, no further normalizing of relations, and robust U.S. opposition to debt relief for Khartoum at the World Bank and IMF. The U.S. should also exert as much influence as possible with China, which has its attention focused on its oilfields in South Sudan. In 2008, then-candidate Obama said, “The government of Sudan has pursued a policy of genocide in Darfur. Hundreds of thousands of men, women, and children have been killed in Darfur, and the killing continues to this very day.” The same stands true today, but does Obama still believe these words, and, more importantly, will he push Khartoum to change? The question has yet to be answered. Eric Reeves is a professor at Smith College and author of A Long Day’s Dying: Critical Moments in the Darfur Genocide (2007).